As you may remember, a few months back we ran a Kickstarter to fund an expanded version of our April Fool’s mini issue, The Journal of Unlikely Coulrophobia. The Kickstarter was successful, and we opened the floodgates to another round of clown submissions. It took some time, but we diligently worked our way through the many excellent stories sent to us, and made some tough choices along the way. Now, we’re thrilled to announce the full line up for Clowns: The Unlikely Coulrophobia Remix! 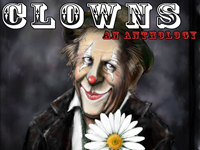 The Table of Contents will include the five stories originally published in Unlikely Story #11.5: The Journal of Unlikely Coulrophobia. We can’t wait to share this amazing anthology with you! In the meantime, keep an eye on twitter and this blog. More details about the anthology, Kickstarter rewards, and our upcoming Unlikely Academia issue, will be coming soon.